I purchased my Marmot Halo 6 tent after selling my tent trailer. I'm an experienced camper and knew the risks of a cheap family tent. I needed something that would perform like my backpacking tents while sheltering me, my wife and boys ages 2 and 4. We have used it on 6 multi night trips to various Ontario provincial parks and have not had the best luck weather wise--but the poor weather provided a great opportunity to see it perform in some potent thunder storms. Long story short: The Marmot Halo 6 will protect you, your family, and gear in extreme rain and wind. You won't be disappointed. 1) The 2 main poles will bend on set up. Doesn't hurt the integrity, but when raising the tent, the pole sleeves have a tendency to creep toward the end you're not at and when you anchor your end, it puts too much stress on the very beefy dac poles producing a bend. I dont know if the sleeve is too short or too long but it happens no matter how careful you are. The one storm we were in also bent 1 main pole. But this one was strong storm, so I think it was rightfully so. It was a 2 day wind storm that destroyed a handful of other tents at the park we were at. Our Marmot Haloy 6 stood up to it. A lesser tent would have become a kite. 2)The vestibule doors angle too close to the tent body and if the outside of the tent is wet you can't open them from the outside without getting wet yourself. The doors are long (tall), which is great (I'm 6'). But I would trade having to crouch a bit on entry if the door flaps didn't get me wet. A vestibule that doesn't follow the shape of the inner tent would probably help but it wouldn't be as sturdy. 3) It is a bit noisy in the wind but you can't have all the interior space and near vertical walls without it being upright. But it's a tent the you can stand up in. The fact that it doesn't get obliterated in bad weather is a real tribute to the folks at Marmot. 4) Odd condensation... I put this down not as a Haloy 6 con but a "big tent con". Just this past weekend I awoke to significant condensation in our tent. Yes, it was warm, but I don't know if the high ceiling magnifies this issue. Does the warm air from us have more time to cool before reaching the tent barrier? Would a tent with a lower ceiling allow for more warm air to escape before condensing on the inside of the tent? The one thing I know is that the lower vents were zipped up because we thought the kids might have been cold. I think the lower vents (which are a big plus) would help manage this issue. This tent is super easy to set up. Two people make it a breeze and 1 can do it, but the first couple of times are a little harder. Great ventilation, very manageable even on really hot days. This tent has a simple floor design, 10x10. Makes it easy to plan sleeping layouts and site selection at parks. Some other family tents are longer and skinnier. Double zippers on vestibule allow for multiple air management setups. Reasonable weight for what you get. Overall, I'd give the Halo 6 tent an 8 out of 10. Honestly, anything you gain in a competitor tent will be offset by having to give up a feature in the Halo 6. Probably as complete a family tent as you can find. It's not cheap but you get what you pay for. 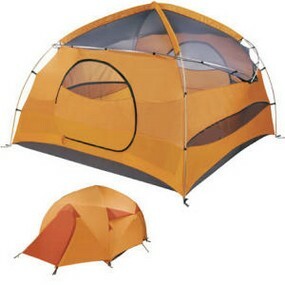 Or read reviews of other Marmot Tents by the editors at Camping Tent Reviews. The fact that it doesn't get obliterated in bad weather is a real tribute to the folks at Marmot. We bought this tent last week and went camping in the Lake District for what was supposed to be a few nights but returned home after the first night. This tent is COLD. The night temp was around 10 celsius, yet I woke up with bloated face and eyes and it took me around two hours to get into functioning mode to be able to cook breakfast. I want to say that we are experienced campers and have never had such a scenario with any of our tents. We have two other tents, one of them is the Marmot Swallow. The Swallow has served us very well for eleven years without any kind of repair. It has double interior zips on the six vents: two entry doors, rear vent, 2 side vents and roof vent - yet the Halo 6P only has single zips on the front and rear doors and there is no way to adjust the ventilation. Fortunately, we bought this tent (along with the separate Halo 6P Footprint) from a great UK company with excellent customer service and have been able to get a full refund. We hope to be buying another large Marmot tent, but we will certainly be checking closely to see if it will have double zips in order to open or close out ventilation. Was this a cost-effective issue on Marmot's part by using only one zip instead of two on each of the two entry ports? I have written to them today to ask them about this issue.